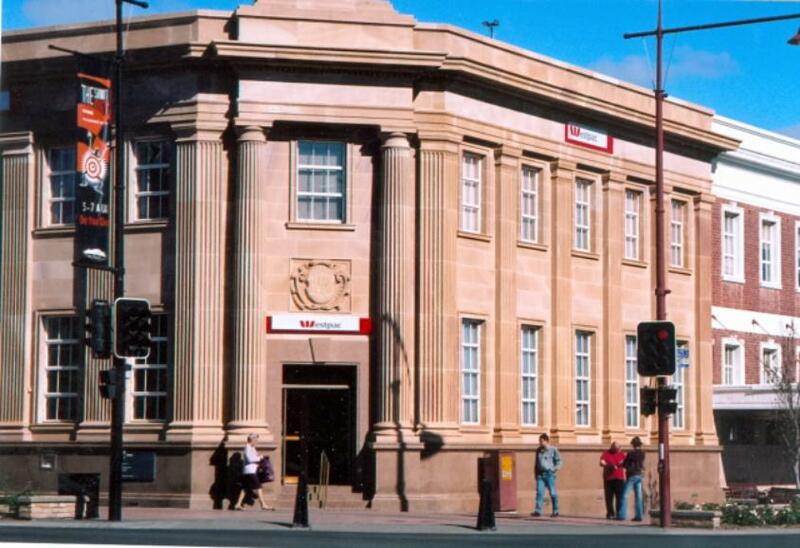 Possibly one of the most well known buildings in the central business district of Toowoomba is the elegant Westpac Bank Building at the intersection of Ruthven and Margaret Streets. The Westpac Bank Building has a polished red granite base course with profiled skirting and polished waist rail. Completing the facade is solid Helidon Sandstone walling with flutted columns, honed walling stones, sandstone window sills, sandstone window frames and Sandstone buttress capping. Over many years the banking business has undergone changes from being known as the Bank of New South Wales to Westpac Banking Corporation and subsequently changes to the corporate signage had resulted in a significant number of sandstone pieces being left with holes drilled, partial sign fixings still in place and some environmental discolouration. Even with age, wear and tear, the building facade maintained both its aesthetic value and structural durability. Recognising the value of the building both financially and as a significant Toowoomba landmark lead the building owner to approach J.H. Wagner & Sons to firstly inspect and report on the stone condition and then undertake detailed onsite works to restore and refurbish the sandstone and granite. The works completed by J.H. Wagner & Sons included full scaffolding and pedestrian access management, removal and re-pointing of grouting, graffitti removal, repairs to stonework for removal of unwanted sign fixings, re-facing of sandstone capping to correct damage caused by water ingress and removal of environmental discolouration. The restoration works by J.H. Wagner & Sons will allow the stonework of the Westpac Bank Building to remain a favoured landmark in the Toowoomba city centre.